The Advanced Fitbit User 18M Steps « Adafruit Industries – Makers, hackers, artists, designers and engineers! 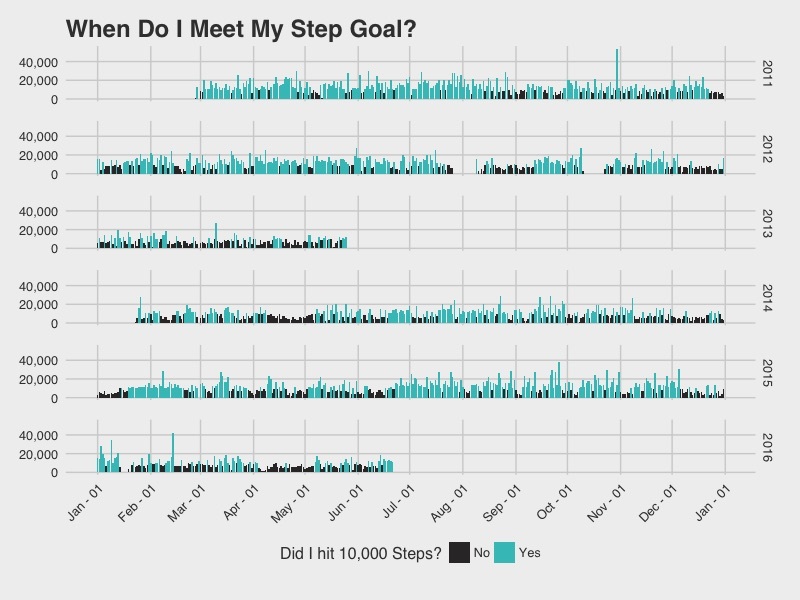 Ernesto Ramirez chronicles his 18 million steps over 5 years using a FitBit. He is a PhD looking for personal meaning through personal data. He is “not a typical user”. Ernesto used R graphics and ggplot2. His scripts and data are on Github. From February 27, 2011 to June 21, 2016 I’ve tracked a total of 18,293,229 steps with Fitbit. I wanted to work on my data analysis and visualization skills so I started to explore this trove of data. What follows is a series of visualizations that start to give some context and insight into my physical activity and overall behavior. So, it turns out I’m not the best at hitting 10,000 steps. When you account for the days I didn’t wear a Fitbit at all, I still only hit 10,000 on 53.4% of days. This year looks to have been especially bad (look at all those black bars! ), and I’m going to blame that on focusing on completing my dissertation — ironic as my research was on how people use Fitbits. 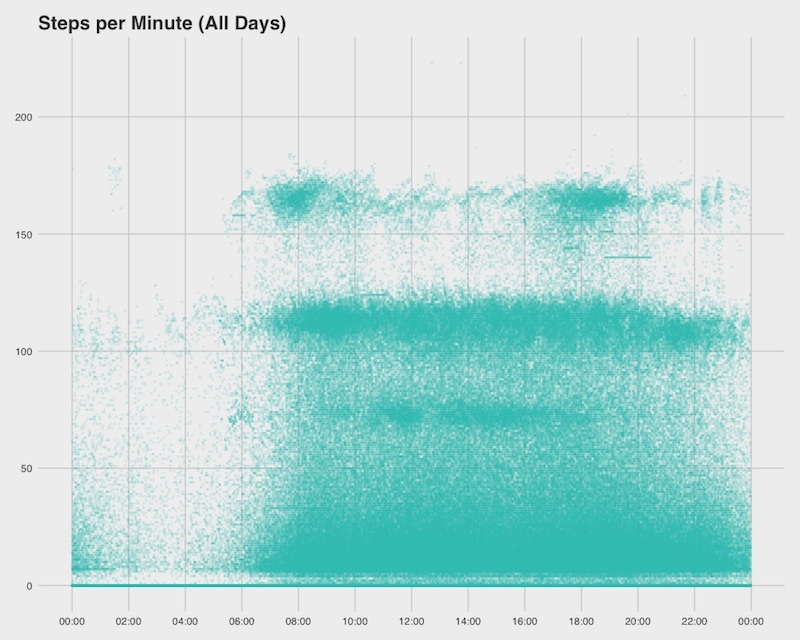 This scatterplot makes it a lot easier to see some different activity patterns. Mostly, I tend to run (steps per minute > 150) in the evenings and my regular walking speed is right around 110–115 steps per minute. Pretty neat! This has only scratched the surface of the data that is available. I haven’t even touched any of the intensity data, or matched data sets from other services like Moves or Strava. I’m going to continue plugging away and as I generate more visualizations I’ll update this post with links. All data used in this post was gathered through Fitabase. Fitabase is a data management and analysis platform used by researchers around the world to incorporate wearables into their research projects. If you’re thinking about using wearables or consumer tools for research and don’t want to mess with APIs give them a holler. They’re great. Many thanks to Aaron Coleman and his team.